With a wide range satisfied users from all over the world, Wrike is considered one of the best project management solutions out there. Used by over millions of people worldwide, available in English and nine other languages, Sold in 120 countries, Wrike is being used by high-performance teams around the world to make their operations faster, more transparent, and effective. Wrike has won numerous awards for its innovative features, amazing integrations, and reliable customer support. Our team of B2B experts has distinguished Wrike as our top product under project management software category for its array of easy to use features, robust capabilities, scalability, and affordability. You can also easily appreciate all the crucial features with Wrike free trial. What makes Wrike a favorite among fans, critics, and review sites alike? In this article we’ll take a look at some of the tool’s major features with some visual help from Wrike screenshots that show how the app looks like in action. A more comprehensive look at Wrike’s features is also available in our Wrike reviews. With Wrike businesses can work smarter and finish work faster. 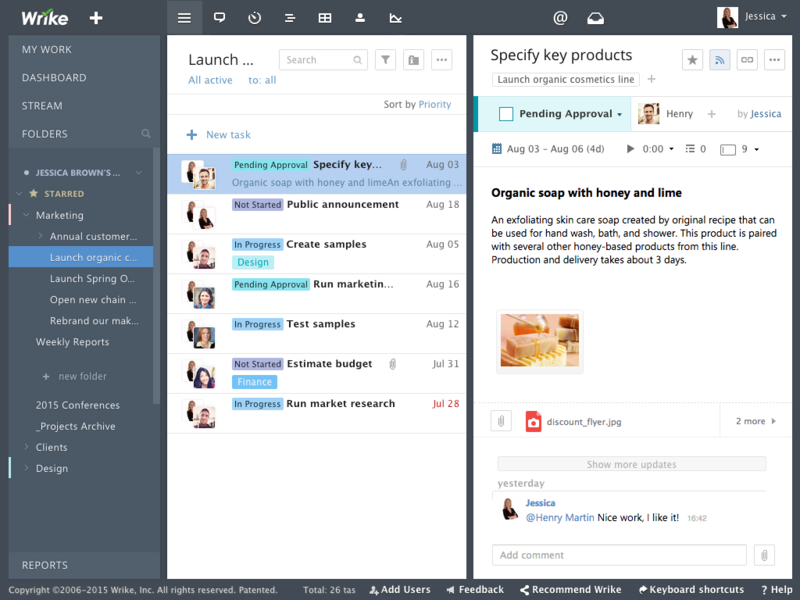 You can organize tasks to finish projects all in one place. Big and complex goals can be broken down into manageable tasks. You can also set deadlines or attach files. In addition, you can monitor the progress of your tasks and the individual contribution of each of your team members. You can @mention teammates so they can easily see your message in their workspace. The tool also enables businesses to communicate as well as share tasks and comments with others who work outside their companies. Wrike offers you a comprehensive and easy to use dashboard that allows you to have a quick look at everything. Deadlines, tasks, and activity streams are some of the contents you would see in your dashboard at a glance. Wrike is arguably the only tool that can make sure your important work stuff will never fall in the cracks in your email inbox. You can quickly transform emails into tasks as well as send them back to Wrike for proper action. This project management solution also integrates with a lot of top applications, enabling you to use the business tools your company needs in one place. Wrike was created primarily for collaboration, allowing teams to perform and collaborate on tasks and projects. Your team members will be on the same page, regardless if a member missed an important update or is absent in a meeting. Wrike enables companies to create customizable views of their most important projects that can include real-time updates, graphs, and tasks’ statuses, making sure everyone is updated. With Wrike, companies can make sure their projects will remain on track and monitor if they have enough resources that are needed to finish projects on time within their budgets. Newsfeed updates on project activities will provide everyone with status reports, reducing the need for meetings and email communication so everyone can focus on the more important stuff. The tool allows you to select the right team members in specific tasks or projects. Wrike also makes it possible to create custom user groups, grant various levels of access controls, and selectively share files. This feature makes sure the right team members will have access to the data they need to become more effective. Wrike enables you to get full control of your operations. The project management solution’s My Work can be your personal place to manage your individual work. It consolidates your tasks from all the projects. My Work allows you to manage regular work by dragging tasks to today or this week, or whatever date you intend to finish them. With Wrike, you can create custom workflows to streamline work at every stage. You can tweak workflows to suit how your team works. These simple and user-friendly customized workflows are best for prioritization, customized work status, and budgeting. You can also use relevant data from your platform’s custom fields to create dashboards with the data that are most crucial to your company. Wrike enables your business to monitor performance and balance resources. Its open view of team workloads allows you to recalibrate if necessary. Wrike allows you to synchronize tasks and project milestones in your platform to virtually any calendar such as Outlook Calendar, Google Calendar, and iCalendar. Wrike’s Gantt-Chart feature helps companies visualize their project plans and perform quick adjustments to the timeline schedule using simple drag-and-drop. With Wrike you can make sure the teamwork continues even when you or somebody from your team is on leave, in the field, or simply not in the office. Anyone can update tasks and receive feedback using the system’s Android and native iOS apps. Thus, you can collaboratively edit and see changes in real-time. You can also edit documents without the need to save or download attachments to your computer. Therefore, there is simply no need to email document updates ever again. Wrike allows you to keep track of the work time spent by your team for better planning and budget management. Google Drive, Gmail, Google Calendar—Wrike integrates with these Google Apps to help your business collaborate better and get more work together. If your company relies on these applications for work and collaboration, then you would find Wrike a good match for you. When your company needs a reliable and efficient project management solution, you should definitely check out Wrike. This article with Wrike screenshots shows that the app is the top project management software available on the market today. It also offers a great free plan that allows you to test the software yourself. You can subscribe to Wrike free trial here.